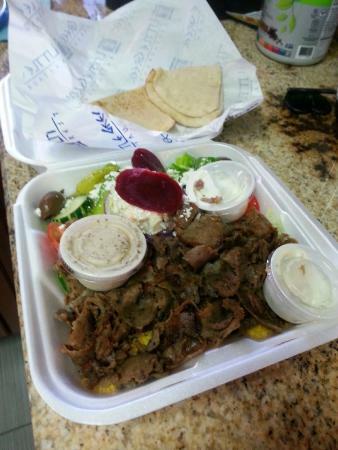 Gyro, chicken, falafel or pork served with lettuce, tomatoes, onions and tzatziki sauce. Chicken and gyro meat combined in one pita. Lettuce, tomato, onions, cucumber, olives and eta cheese with greek dressing. Turkey breast, eta cheese, lettuce, tomatoes, and onions. An American favorite - char-grilled 100% beef patty now wrapped in pita with lettuce, tomatoes, onions and tzatziki sauce. Grilled chicken, lets, lettuce, tomato, onions and tzatziki sauce. Grilled salmon fillet over rice with greek salad. 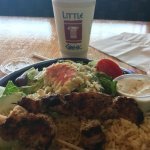 2 Char-gilled skewers over rice with greek salad. Oven​ baked eggplant, potatoes, ground beef, covered with bechamel sauce. 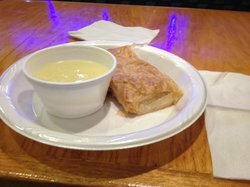 Served with greek salad or soup and pita. Macaroni, ground beef, topped with bechamel sauce. Served with greek salad or soup and pita bread. Tender stuffed grape leaves six served with greek potatoes, choice of greek salad or soup and pita bread. Two boneless chicken breast over rice with greek salad or soup and pita bread. 3 Char-grilled skewers over rice with greek salad. Under 12 only please. Comes with drink. Served with marinara or butter and pita bread. 发现这个地方旅游的时候我和我的堂兄棕榈海港和我很高兴我们去了! Pita的都是新鲜和美味的! 所有的蔬菜很脆,肉都是经验丰富的做的很好。 价格也很合理! 这是一个希腊版本的地铁站,大约3凹槽发火! 很不错,价格也很合理健康的食物也有很好的服务; 很棒的组合!